January 26th, 2008: Sunny and Cold, Water Temps 41* at the Splits , 50* at the Dam and Clear. 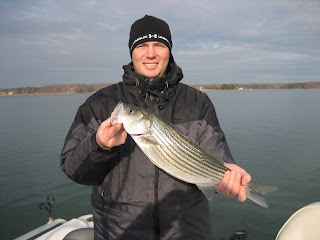 Caught Herring and picked my Clients up at High Point Marina this morning and went in search of Stripers. Looked in Mitchell and up around the Splits , not seeing what I wanted to see on my Lowrance and too many birds picking up the previous nights shad kill so I moved downlake and set up in the back third of a creek pulling Planner boards and free lines. We worked the banks out to 25 feet deep with our spread and got bit 3 or 4 times but the fish were hitting short and I decided to move. Went and set up on some deeper flats in 25 t0 35 feet of water where I had seen schools of Stripers earlier in the week and worked them briefly with jigs but I the were not positioned to feed so I looked some more . I found fish a little shallower that looked catchable so I put out some downlines rigged with Herring and worked them for a few minutes but they kept moving up in the water column so I decided to get my downlines in and set out a spread to planner boards to cover the upper water column. Once I got my spread out I moved over to where I saw the fish and got 6 hits within 5 minutes. We worked the area for 2 hours and got 15 more hits. 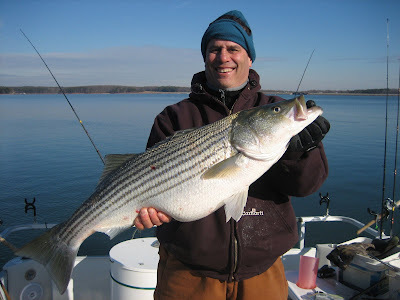 We had a great afternoon catching plenty of fish with the largest Striper being caught by Steve. The fish hit a Herring on a board in 18' of water and after a short battle we boated the fish. It was 34 inches long, broad shoulders with a Fat belly, somewhere between 18 1/2 and 19 pounds. We released all our fish today to be caught again. 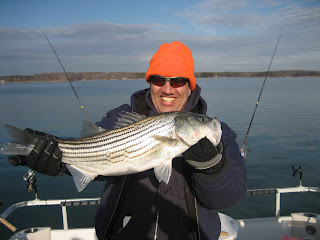 Steve had booked this trip a month ago and in our conversations prior to the trip I had told him fishing was generally poor for this time of year for Lake Anna and warned him that it may be slow today but their patience in letting me work the depth finder and find Stripers that wanted to eat payed off for them.